Stefan Jekel covers international listed companies at the New York Stock Exchange, a wholly-owned subsidiary of Intercontinental Exchange Group, Inc. (NYSE:ICE). As part of the NYSE's Global Corporate Client Group, Stefan Jekel is NYSE's New York-based team member responsible for global issuer coverage where he is responsible for maintaining the Exchange's relationships with more than 500 companies across 40 countries. His role includes consulting international companies to increase their understanding of the strategic benefits of an NYSE listing and the NYSE's service initiatives. 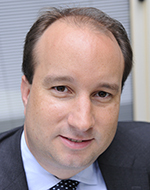 Stefan Jekel joined the New York Stock Exchange in 2001. Prior to joining the NYSE, Stefan Jekel has been Senior Associate with the New York office of PricewaterhouseCoopers LLP where he specialized on international clients seeking to resolve cross-border financial reporting and valuation issues. Stefan Jekel holds a Master of Business Administration from New York University (USA).